Emporio Armani is Giorgio Armaniâ€™s second line. A diffusion line committed to luxury essentials, it delivers contemporary collections designed with everyday luxe wear in mind. 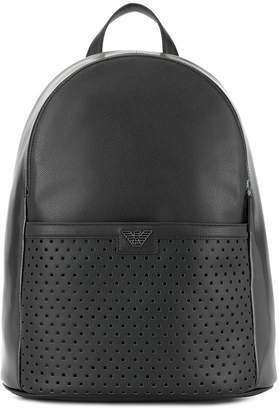 This black leather logo patch backpack from Emporio Armani features a top handle, an all around zip fastening, a main internal compartment, adjustable shoulder straps, a front logo patch and a mesh front pocket.